“30 Teams, 30 Posts” (2015): So, are the Cardinals the “Best Fans in Baseball”? In 30 Teams, 30 Posts, I write a post about every MLB team in some way in the lead-up to the beginning of the 2015 season. Previous installments can be found here.Today, we look at the evidence for and against the claim that St. Louis is home of the “Best Fans in Baseball”. A Wall Street Journal article on what cities get the best TV ratings for each sport (and not just for their home teams, but for nationally televised games in general) had St. Louis as the top location for baseball. The Cardinals were the top-rated (as far as percentage) team in baseball locally/regionally last season. Former Commissioner Bud Selig said so, and no matter what you say about Selig, it can’t be argued that he probably had been to every stadium in the league, probably several times. The Cardinals were second in attendance last season, behind only the Dodgers, who have a larger stadium and a much larger fanbase numerically. They have averaged over 40,000 fans every year except once since 2005 and been in the top four in NL attendance every year except once since 1996. Anecdotal evidence online says that the team leads the league in number of fans who keep score, to the point where the old Busch Stadium apparently showed score-keeping marks for batters so that people who had missed something could fill it in (I’m not 100% sure about this, but I remember reading it somewhere). The Cardinals haven’t been last in the league in attendance since 1916. And, yes, they do show an appreciation for good baseball, even, at times, when it’s an opponent doing it. They count Ellie Kemper and Jon Hamm as members, and Unbreakable Kimmy Schmidt is awesome. Not really relevant to this discussion, just sort of throwing it out there. St. Louis, despite it’s passion for the Cardinals, obviously wasn’t baseball-crazy enough to keep the Browns from moving back in the 1950s. Although, to be fair, the Browns almost perpetually were crummy. The racist, homophobic and generally disgusting people showcased on the “BestFansStLouis”, which I refuse to link to for consideration of human dignity. However, it should be noted that every sports team has plenty of fans who are horrible bigoted a-holes, it’s just that they don’t have Twitter accounts devoted to them. It was Tywin Lannister of Game of Thrones fame that said: “Any man who must say ‘I am King’ is no true king.” With that in mind, one must wonder if any Cardinals fan who calls the Cardinal faithful the “Best Fans in Baseball'” is truly worthy of being called the Best Fans In Baseball. Have overlooked the flaws of many of the team’s great players and managers, such as steroid use, drinking, etc. etc. Although, again, this is true for every single team’s fanbase. It is nearly impossible to truly figure out who the best fans in anything are, since there are so many things to consider and ultimately it is a vague intangible title that can change based on definition, a team’s fortunes, and other factors. So, the verdict is… Cardinals fans are likely, but not definitely, the Best Fans in Baseball. But as the last “against” proves… it really doesn’t matter. 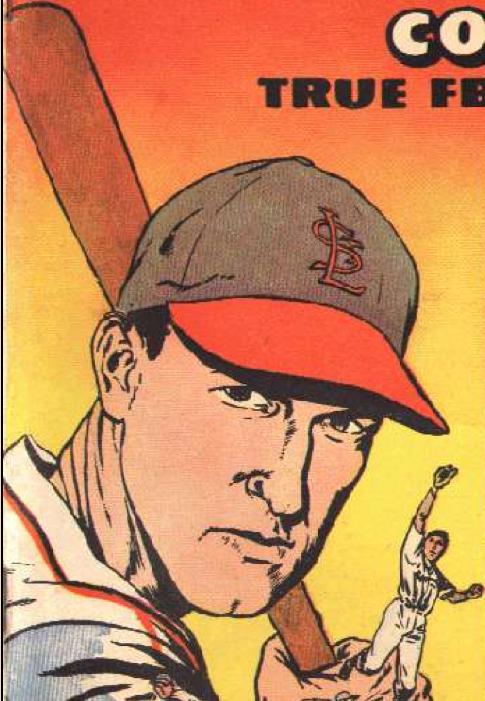 A shorter one today, as we go back to bio-comics, this time looking at Stan Musial. Now, I’ve done a bio-comic before, but this one is different because it’s from a different era- the Golden Age of Comics! To be more specific, it’s from True Comics #78, in August 1949, from “Parents Magazine”. This is from the late Golden Age, a time where super-hero comics were in a low period and were being replaced by crime, horror and romance comics, no doubt leading to good wholesome fun like this to held up as being the last bastions of innocent virtue in comics. The World Cup is going on now in Brazil, so perhaps there is no better time than now to talk about Frank Borghi. Well, let’s go back to 1950. It was a World Cup year, with the tournament in Brazil then, as it is now. And Team USA was in it then, as it is now. However, this was decades before the United States was even semi-competitive in international competitions, and the team was made up entirely of amateurs or semi-pros, many of them from St. Louis, a hotbed of soccer much like it is a hotbed of baseball. It was from St. Louis that Frank Borghi came into the picture. Borghi was the team’s goalkeeper, primarily because he lacked much leg strength to actually kick the ball well. Of course, that wasn’t his main profession- he made his living in the funeral home business, and at the time was driving a hearse as his day-job. Not surprisingly, his relative inexperience showed early on, as he had given up 3 goals to Spain in a 3-1 loss. It wasn’t looking any easier, with England coming up and with a team made entirely of their top professional players, having already beaten Chile 2-0. But a funny thing happened: the United States won, 1-0, on the strength of a goal in the 38th minute by Joe Gaetjen, a Haitian cook (others say he was a dishwasher or student, or possibly all three) who lived in New York and was only on the team due to the lax FIFA citizenship regulations of the time. The win wouldn’t have been possible without Borghi, who constantly stopped the English onslaught, holding them scoreless despite 20 shots on goal. The end result was a shocker. It is said (possibly inaccurately) that many newspapers around the world, not believing the result, printed it as a 10-0 win for England, having thought there was a mistake. It probably looked even more shocking a few days later, when the USA was trounced by Chile, 5-0. Which brings us back to Borghi. After all, he was a goalie mainly because he didn’t have much leg strength, which begs the question of how he got into soccer in the first place? While in Carthage, Borghi would have likely caught for future MLB pitchers Cloyd Boyer and Bob Habenicht. Borghi, however, would never reach anywhere close to the bigs as a baseball player- according to Baseball Reference, 1946 would be his only year professionally (other sources say that he played more than that year, but it’s possible that those were in non-affiliated leagues or simply have been lost due to the haphazard score-keeping and coverage of the minors at the time). After his professional baseball career ended, he spent more of his time on soccer… which is how a washed-up catcher helped Team USA pull off one of the biggest upsets in soccer history. Borghi still lives in St. Louis and is a member of the St. Louis Sports Hall of Fame and the National Soccer Hall of Fame. While browsing eBay for baseball-related comics and Godzilla DVDs (easily two of the 50,000 best uses for eBay), I came across something interesting being auctioned that had originally come from an estate sale for Stan Musial. It’s not unprecedented, in fact, I’ve written about it before. However, this is, to the best of my knowledge, the first time ever that you can go through a dead Hall of Famer’s wallet. Because, well…. 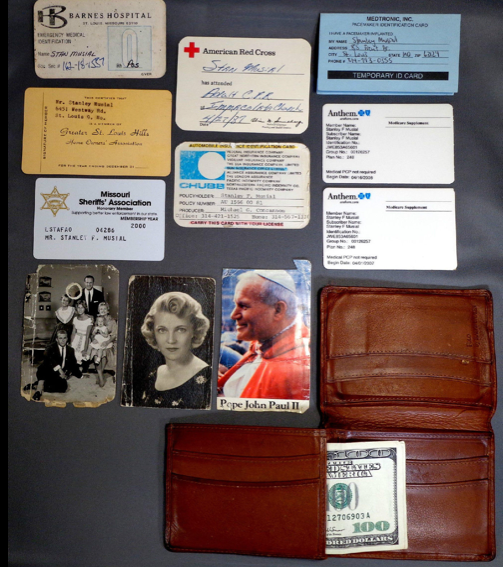 Stan Musial’s wallet, and it’s contents, are currently for sale. Yeah. Seriously. If you ever were a creeper enough to want to own a now-dead Hall of Famer’s family photos, insurance cards, proof of CPR training, honorary sheriff membership, devotional image of Pope John Paul II and a few hundred bucks… now you can. And, guess what? You can even see the late, great, Stan the Man’s address, phone number and social security number. Seriously. I’m not sure if this is funny or disgusting. Or, possibly, both. Well…Only the internet, I guess. Oh, boy, the NL Central! It’s time for another round of Best Case/Worst Case. And, since the Cubs are in this division, you know there’s going to be a worst case. And, of course, they all have at least vaguely-connected images from Getty on them. Yeah! Best-Case Scenario: World Series title, obviously. They aren’t that different a team from last year aside from losing Carlos Beltran and Edward Mujica as well as trading the not-what-he-used-to-be David Freese. Worst-Case Scenario: The Rally Squirrel returns… rabid and with a taste for human flesh. Worst-Case Scenario That Could Actually Happen: Injuries to the pitching staff, particularly Adam Wainwright. Best-Case Scenario: .500 again! The playoffs again! And this time, going further than the LDS, but all the way to the World Series. Worst-Case Scenario That Could Actually Happen: The rotation and bullpen regress while Andrew McCutchen has a post-MVP hangover. Best-Case Scenario: It’s a team that’s good enough to win the World Series if their pitching works out… but that’s a big if. Still, best-case scenario remains World Series. Worst-Case Scenario: Billy Hamilton runs so fast that he breaks the sound barrier, making everyone in the stadium go deaf. Worst-Case Scenario That Could Actually Happen: The pitching doesn’t do it, and the Reds go nowhere in the playoffs, if they make it at all. Best-Case Scenario: Ryan Braun comes back from his Steroid-related… break… and returns to form despite the fact he, presumably, is no longer… doing the thing he was suspended for. The rotation does well and the Brewers stay in it for awhile before fading late in the season. Worst-Case Scenario That Could Actually Happen: More-or-less what happened last year, only with Ryan Braun playing the whole season. Well, okay, it could get worse: they could be worse than the cubs. Best-Case Scenario: Anthony Rizzo and Starlin Castro continue to develop, nobody gets hurt, and Theo Epstein’s Master Plan (C) continues. Worst-Case Scenario That Could Actually Happen: Injuries and being in a tough division lead to the team being one of the worst in Cubs history. Rizzo and Castro have slump seasons, too. Next time: The NL East!